A beautiful beach getaway on the island of St. Barth's, Le Sereno offers vacationers 36 stylish suites and 3 luxury pool villas. The hotel is set on a pristine sandy beach at Grand Cul de Sac where you can swim in the warm waters of the Caribbean Sea. St Barth's is a popular Caribbean vacation destination, especially during Thanksgiving, Christmas and the winter months. The island attracts celebrity guests with its sunny weather and luxury accommodations. The hotel was designed by the renowned French designer Christian Liaigre, whose projects include private residences of Calvin Klein and Karl Lagerfeld. He also designed Hotel Montalembert in Paris and the Mercer Hotel in New York. In addition to the beautiful sandy beach, the hotel has a swimming pool, a sundeck, a restaurant and a spa pavilion, all with scenic water views. If you want to be right on the beach, book a Grand Suite Plage which offers panoramic views of the Sea. The suite has a large sundeck from which you can enjoy views of the water. If you are planing a family trip to St Barth's, ask for a two-bedroom Family Grand Suite Plage. The 2,000 square foot suite has a private garden and a spacious outdoor deck, perfect for family time in the sun. Restaurant des Pecheurs serves delicious fish and seafood right on the water. For a casual meal on the beach, head to the Bar and Lounge. 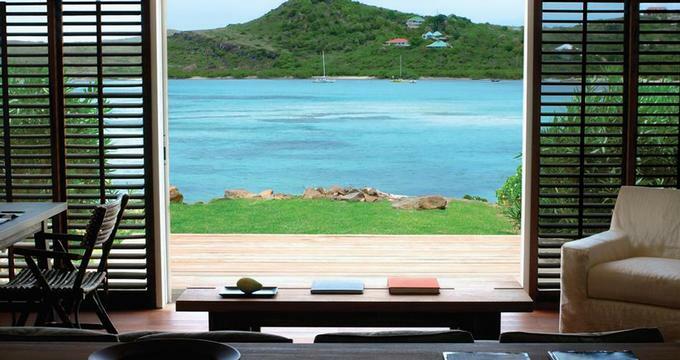 Escape to the beautiful tropical island of St Barth's and stay in your own private villa on a sandy beach. Choose from 3 luxury accommodations with spacious layouts and relaxing outdoor decks. Perfect for honeymooners who love a great view, Villa Vue Mer offers a 6-foot Wood Hot Tub on the outdoor deck overlooking the ocean. The one-bedroom house has an outdoor garden, dining table and a huge outdoor day bed next to the hot tub. You can't get any closer to the water than Villa Du Pecheur which is set on a sandy beach. The villa has a private swimming pool and an extensive outdoor living space with a day bed and a dining table. The pool is surrounded with a garden for privacy. The Christian Liaigre-furnished bedroom features a a four-poster bed and his signature mirrors. A separate living area has a sofa bed, a large table, armchairs, a coffee table and a desk as well as a large wardrobe and a visitors' bathroom. If you are planning a family trip to the tropics, book Village du Pecheur which can be combined with two adjacent Grand Suite Plage to create "Le Village du Pecheur". The family house has a private swimming pool, garden and a spacious outdoor deck for family fun in the sun. Room rates start at 432 Euro per night.